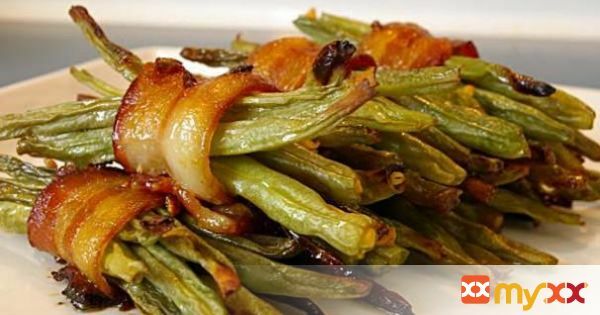 You never knew green beans could taste so amazing! 1. Preheat oven to 425°F. Grease a 10×15 inch baking dish and set aside. 2. Wrap 8 or 9 green beans with a strip of bacon and place in prepared dish. Repeat. 3. Combine butter, brown sugar, garlic, and soy sauce. 4. Pour over green beans. 5. Bake in preheated oven for 25 to 30 minutes, or until bacon and green beans are browned and crispy.